Janet Cannon has been teaching double bass, cello and viola da gamba to all ages for many years. She began playing double bass at the age of 10 in a school music program in Utah. She participated in a youth symphony tour to Mexico as a double bass soloist, and after earning her Bachelor's of Music at Manhattan School of Music, returned to Mexico, where she was engaged by various orchestras, including the Sinfonica National de Bellas Artes. After six years, the spirit of adventure and a desire to continue developing as a musician took her to France where she had the privilege of studying with the extraordinary bassist. Fancois Rabbath. She earned a teaching diploma from the Institut Francois Rabbath. After working in a chamber orchestra, Janet began teaching and free-lancing. Her love for early music led her to complete a diploma in historical performance practice at the Conservatoire National de Toulouse, and to enlarge her scope to include playing the viola de gamba or bass viol. She received a scholarship from the University of Michigan, and on from the Center for the Education of Women, to complete a Master's Degree, studying with Dr. Diana Gannett. She completed her degree and has training in the Suzuki method as well, to better serve young students. She is also very experienced in getting older beginners off to a good start! Janet is passionate about the importance of finding a comfortable , body friendly approach to instrumental music. She will offer regular body- work sessions to help you learn how to best use your physique within its natural aptitudes. She is also experienced at gently introducing reading and theory skills for those who find them difficult. 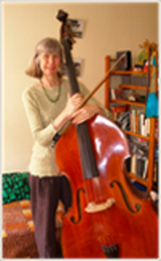 Janet Cannon : Double bass, Cello, Viola da gamba, Chamber Music, Solo and Ensemble coaching, Elementary music reading, Body work for musicians.